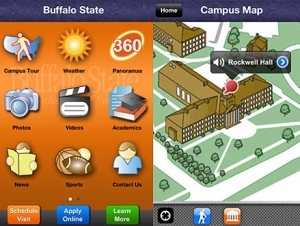 Get ready to see Buffalo State from a whole new perspective—whenever and wherever you want. A new, interactive tour and complementary mobile app is providing access to campus 24 hours a day, seven days a week. Featuring 360-degree panoramas of the university's facilities and residential areas, the guided tour gives visitors an instant overview of Buffalo State’s 125-acre campus. Through engaging videos, two student guides, and photo galleries, viewers can explore everything the college has to offer—a diverse and creative environment, a broad array of academics, hands-on learning opportunities, affordable tuition, and a historic location—and take the next step toward enrolling by scheduling a visit or applying. The new site is part of YouVisit.com. Walking tour - Travel from Rockwell Hall to the Sports Complex and back in minutes with this step-by-step guided tour. Follow the tour path, or jump to points of interest while taking in campus landmarks. 360 Panoramas - Examine Buffalo State's learning facilities and amenities from top to bottom. Videos - Watch the latest from Buffalo State's official YouTube channel—academics, athletics, news, and fun. Photos - A picture is worth a thousand words, which would make this photo gallery one very long book! Peruse photos of Buffalo State events, classes, facilities, and more in this extensive gallery. Current weather and forecast - Will you need an umbrella or sunglasses when you visit Buffalo State? Find out with this detailed look at current and upcoming weather conditions.